Using GSS is part of a free web series, GWB Online Academy, by Aqueous Solutions LLC. 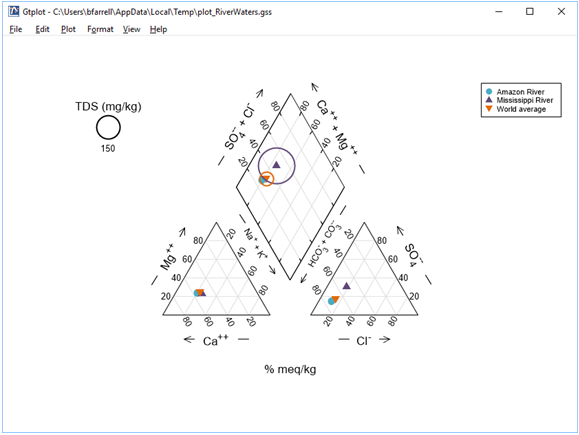 GSS is a spreadsheet program designed for geochemists. GSS datasheets hold the results of chemical analyses, as well as values calculated from those results. 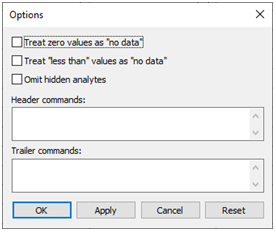 You create a datasheet by typing, pasting, or dragging analyses for your samples into GSS. 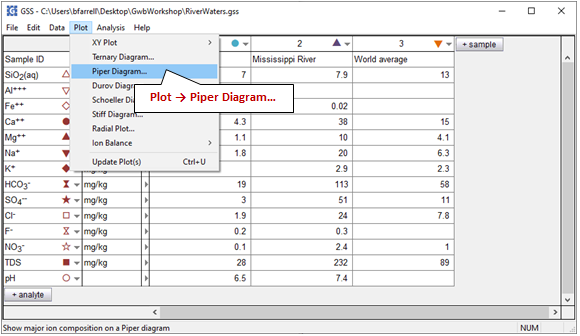 You can then convert units, create plots and diagrams, mix samples, compare replicate analyses and check standards, calculate speciation and saturation, and more. 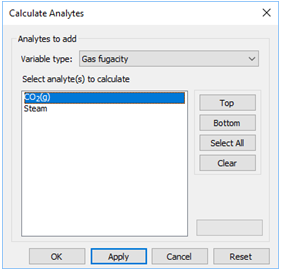 You can drag samples into the other GWB apps, and drag calculation results from the other apps into GSS. Analytes and their units are listed in the leftmost columns. Columns to the right hold data for the samples. 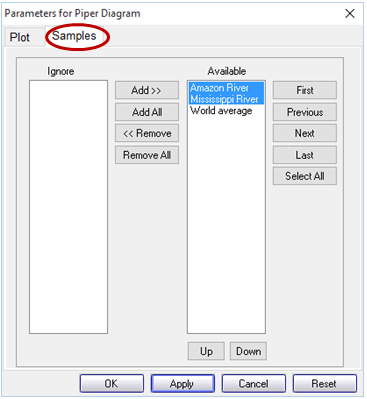 You add analytes to the datasheet by clicking on the button, and samples with the button. Exchange rows and columns by selecting Edit → Transpose Data Sheet. then right-click on the unit field and select a new unit under the Units pulldown. select Yes. The analyses for the components you selected should now appear in the new units. If you had selected No, the unit designation would have changed, but the numerical values would have remained unaltered. Why can’t TDS (Total Dissolved Solids) be converted to mmol/kg like the chemical components? Laboratories commonly report analyses in elemental equivalents, such as sulfate as mg/kg of sulfur, or bicarbonate as mg/kg of carbon. 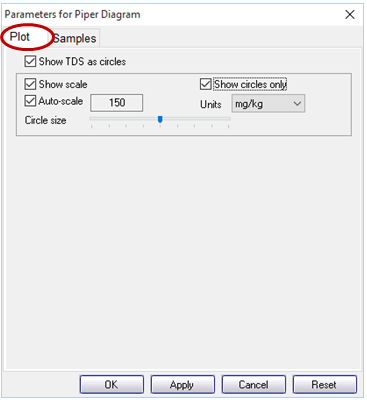 To specify such a unit in a GSS spreadsheet, choose the “SO4--” analyte, for example, right-click the units column, and select As → “S” rather than As → “SO4--”. Try this out: Select the HCO3− and SO4-- analytes and convert them, respectively, to mg/kg of carbon and mg/kg of sulfur. Do your results make sense? You can similarly set concentrations in species equivalents, in terms of protonated or deprotonated forms of the species in the spreadsheet, such as bicarbonate as mg/kg of carbon dioxide, or ammonium as mg/kg of ammonia. To specify such a unit, choose the “HCO3−” analyte, for example, right-click the units column, and select As → “CO2(aq)”. The Piper diagram is useful for portraying the major ion composition of a suite of samples. 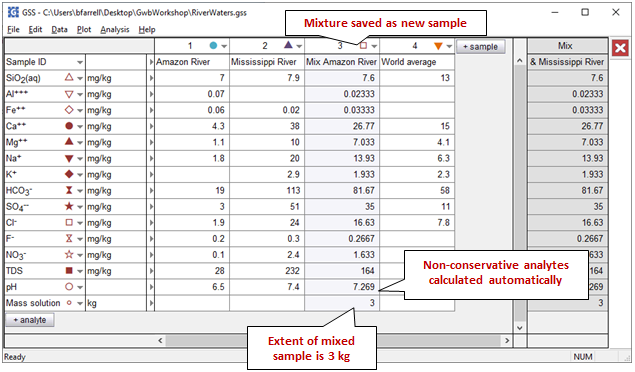 How does the Mississippi River sample differ from the others? Take a moment to explore the other types of plots available in GSS under the Graphs pulldown. Some types, like the Stiff diagram, Radial plot, Bar chart, and Pie chart, plot data for multiple samples side-by-side. Other types, like the cross, series, and time-series plots, as well as the Ternary, Durov, and Scheller diagrams, represent an arbitrary number of samples on a single set of axes. 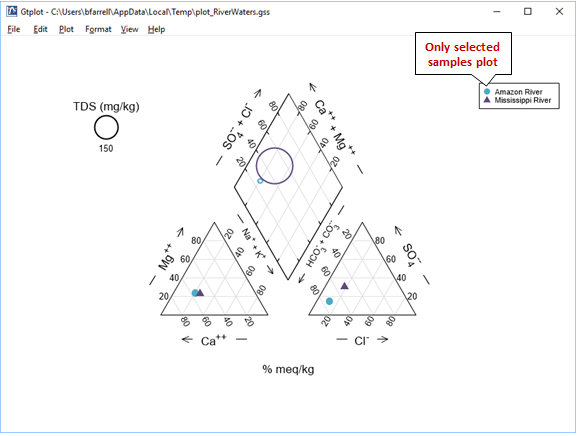 GSS works with program SpecE8 to compute secondary values, such as mineral saturation and gas fugacity, from the chemical analyses in a datasheet. The secondary values, known as “calculated analytes”, are added to your datasheet. 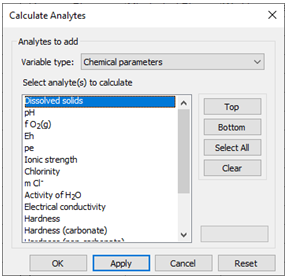 To add a calculated analyte, click on → Calculate..., and on the dialog that appears, choose, for the various variable types listed, one or more analytes to add. Choose a variable and click Apply. Click Apply. Now set “Variable type” to “Mineral saturation”, choose “Calcite” from the list, and once again click Apply. 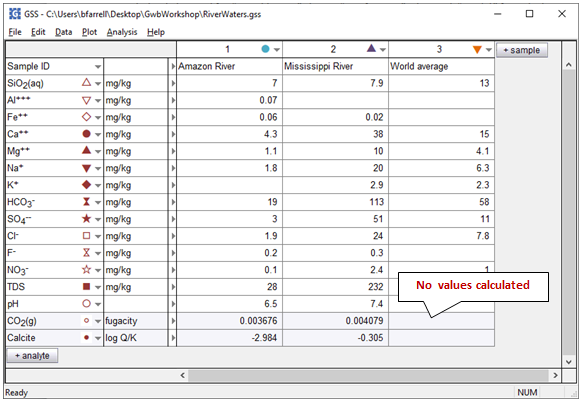 Can you explain why the program did not report values for the “World average” sample? Before finishing up, look at the other variable types GSS can calculate. You can, for example, compute the concentration, activity, and activity coefficient of individual species. Conversely, you can calculate the masses of components in the fluid when you have information about an individual species. Knowing pH, for example, you can use GSS to figure total mass of the H+ component for a suite of samples . GSS can mix two or more samples together to create a new sample. 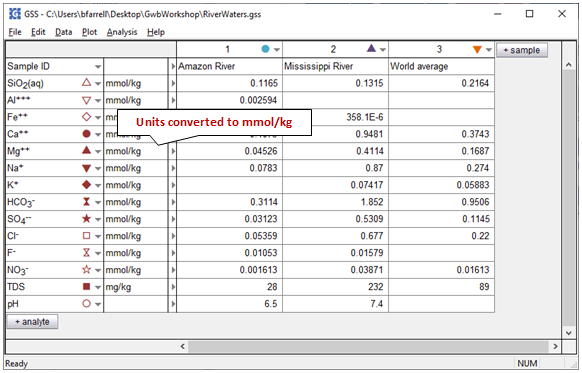 In this task, we'll mix Amazon River water with water from the Mississippi River, in a 1:2 ratio by mass. 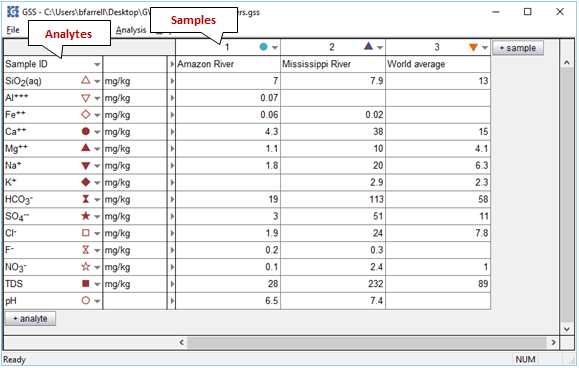 Choose the Amazon River and Mississippi River samples, then click Next. Click OK to move to the next step of the wizard. 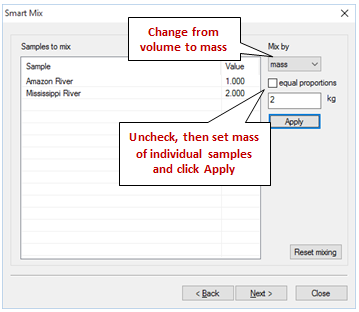 GSS can mix samples in terms of volume or mass. 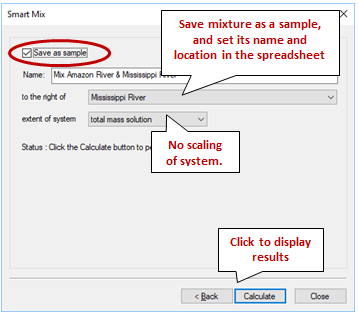 The program mixes samples in equal proportions by default, but you can control the proportions by adding the “Mass solution” analyte to your spreadsheet or by setting the volume or mass of each sample directly within the wizard. In our case, we'd like to mix 1 kg of Amazon River water with 2 kg of Mississippi River water. 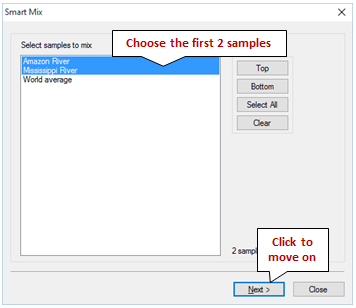 To do so, choose “mass” under “Mix by” then uncheck “equal proportions”. 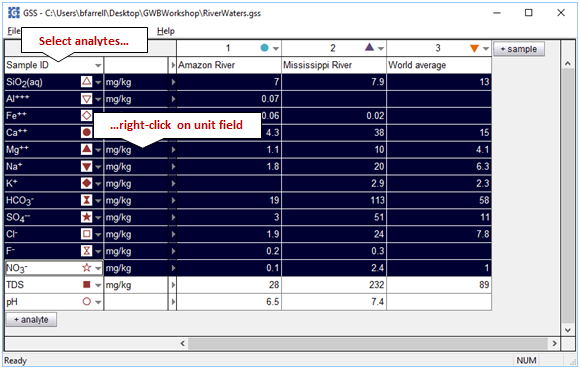 Leave the Amazon River sample at its default value of 1 kg, then select the Mississippi River sample, enter 2 in the field to the left of “kg”, and click Apply. Click Next to move on to the next step of the wizard. If a sample's status is listed as “failure”, you should click “More info…” to investigate why the sample failed to converge. 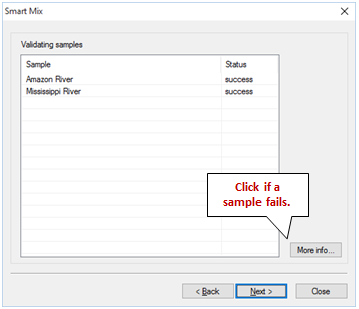 Close the wizard and verify the input for each failed sample, or leave the failed sample out of the mixing calculation when relaunching the wizard. If all the samples' statuses are listed as “success”, click Next to move to the final step of the wizard. Click Calculate, then click Close to display your results. You may hide the results pane by clicking on the . The concentration of the various fluid components in the mixture is a weighted average of their values in the original fluid samples. Unlike in earlier versions of GSS, the values of non-conservative analytes like pH have been calculated automatically. As an alternative to mixing fluids in GSS, you can simulate mixing processes and make “flash diagrams” using React. Navigate to the Fluid Mixing and Scaling topic to try it out for yourself. 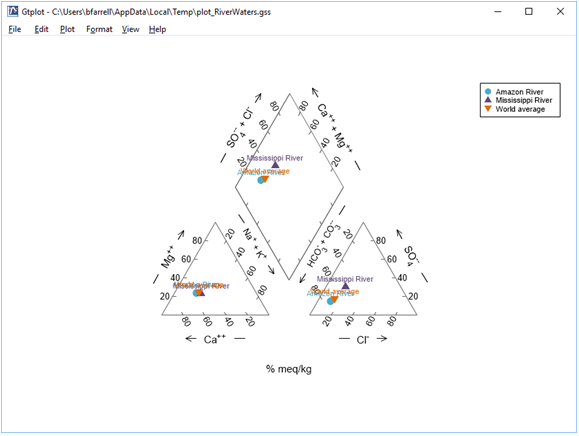 Bethke, C.M., B. Farrell, and S. Yeakel, 2019, The Geochemist’s Workbench®, Release 12: GWB Essentials Guide. Aqueous Solutions LLC, Champaign, IL, 198 pp. Hem, J.D., 1985, Study and interpretation of the chemical characteristics of natural water. US Geological Survey Water-Supply Paper 2254. Comfortable with using GSS spreadsheets? Move on to the next topic, Stability Diagrams, or return to the GWB Online Academy home.